LOW MILES!! Navigation! Moonroof! Heated/Cooled Leather Seats! Experience the powerful presence of our 2015 Ford F-250 Lariat Crew Cab 4WD shown in radiant Tuxedo Black. Bestsellers for decades, our F-series trucks continue to win the hearts of those who drive them. Powered by a 6.2 Liter V8 that offers 385hp on demand while teamed with a TorqShift 6-Speed SelectShift Automatic transmission, this Super Duty truck can handle your toughest jobs with ease and efficiency. For work or play, you will feel confident with the Four Wheel Drive Lariat s smooth power and handling. F-250 is built incredibly strong with great payload and towing capacity. Fog lights, a shiny chrome grille, bumpers, and unique wheels add a touch of style. Inside, the Lariat Crew caters to your comfort with luxurious leather seats, wood grain trim, keyless entry, and an integrated trailer brake controller. Ford Sync w/ Sirius allows you hands-free communication and up-to-date information. A power-sliding rear window, rear parking sensors and power telescoping mirrors are nice extras. Safety is always number one with Ford and the F250 is at the top. Six standard airbags, SOS post-crash alert, and Roll Stability Control keep you safe and secure. The Ford F250 is an impressive, powerful choice. 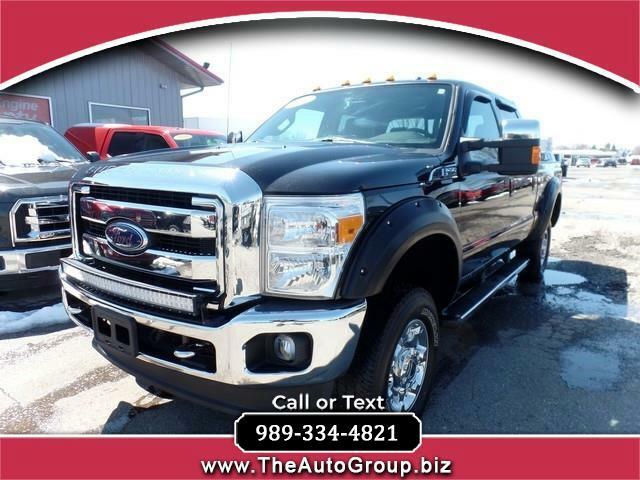 You will love being behind the wheel of this Ford Tough Truck! Print this page and call us Now... We Know You Will Enjoy Your Test Drive Towards Ownership!